Family Health News is now offering its carefully selected supplements for a range of health issues on retailer VitaBeauti.com, including products harnessing the power of minerals, enzymes, amino acids, oxygen and more to aid in weight loss, detoxification and overall gastrointestinal health. 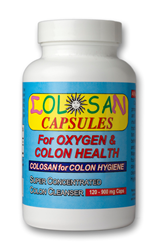 Gently cleanse the digestive tract with oxygen using Family Health News’ gentle, easy to use Colosan Capsules for Oxygen & Colon Health. Oxygen plays a major role in blood and circulation. This is why oxygen is a base of our Colosan and Vital O Daily Oxygen, Enzyme and Mineral supplements, as well as our Burn Clean for Well Being program. Family Health News will offer five supplements from its extensive catalogue, including supplements used in its Burn Clean for Well Being regimen for detoxing and cleansing the body. VitaBeauti.com now offers: Colosan Capsules for Oxygen and Colon Health, Colosan Powder for Colon Hygiene, Hepasan Liver Cleanse, Osteo Pro-D Bone Health Cream, and Vital O Daily Oxygen, Enzyme and Mineral Supplement. Taggart has long been fascinated with researching and testing healthcare products, spending more than a decade studying the efficacy of alternative and allopathic medicines. Taggart has reviewed more than 8,400 supplements since 1989, writing about these supplements in his free magalog that is distributed nationally. Taggart finds a balanced approach at healthcare entails dietary supplements, and a healthy lifestyle. For more information on Family Health News products, available now on http://www.vitabeauti.com, visit http://www.familyhealthnews.com. To learn more about Family Health News’ Burn Clean for Well Being program for overall health, visit http://www.burncleanforwellbeing.com.